Using the legend of the Trojan War, the Iliad addresses the central questions defining the war experience of every age. Is a warrior ever justified in challenging his commander? Must he sacrifice his life for someone else's cause? Giving his life for his country, does a man betray his family? How is a catastrophic war ever allowed to start - and why, if all parties wish it over, can it not be ended? As she did with The Endurance and The Bounty, Caroline Alexander lets us see why a familiar story has had such an impact on us for centuries, revealing what Homer really meant. 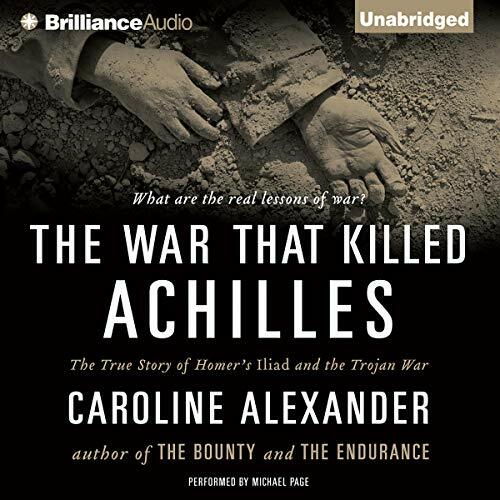 Written with the authority of a scholar and the vigor of a best-selling narrative historian, The War That Killed Achilles is a superb and utterly timely presentation of one of the timeless stories of our civilization. ©2009 Caroline Alexander (P)2009 Brilliance Audio, Inc.
Alexander has done a great service to those of us who struggled with The Iliad years ago in high school or college. Here she provides an interpretation which will leave everyone who reads it (or listens for that matter) wondering why our teachers did not make this work so interesting. Perhaps it is maturity that has caused me to return to this volume and this fine book orienting us to it. The writing is good, the reading good, and the content well worth the effort. This book is so informative and easy to listen to. A must buy for any fan of Greek History. Exactly as my title announces, there is less history to be had in this work than there is literary extrapolation. Some of it is very much historical, as this extrapolation comes from earlier tribes and traditions, keeping in mind there are hundreds of years between the Trojan War and Homer's Iliad. If you're looking for pure history, you won't find it here. There is history to be had, but it's more breakdown of the characters and themes that make The Iliad the great work that it is. As a literary analysis, this book is a home run. Having read both prose and poetic verse translations of the classic epic, this book operates more like a college thesis on Homer's tale. For the scholastically-inclined, this isn't a bad thing. I might even suggest that for those who couldn't finish The Iliad (you know who you are), this book might be the catalyst for higher appreciation that's needed. This was a nice look into the details of war using Homer's epic as a glass to explore. It is one of those books that is difficult to shelve. It isn't a history of the Trojan War. It isn't exactly an examination of the Iliad. It was like examining the corpse of a classic to better understand what killed the poem. I've read the Iliad a couple times now, but Alexander's skill is showing the reader just how modern this ancient epic was. Homer wasn't satisfied in providing another heroic epic tale. He subverted this form a bit. His hero wasn't interested in fighting, killing, or war (although there was probably none better at all of these things). Achilles wanted life, home, and family. This book moves through this tragic epic and allows Homer's words room to bang and bite. It wasn't a perfect book, but it was interesting and rather novel in its approach. Having family that fought and returned different from war, it is valuable for me to read anything that will give me a glimpse or hint at the motives and nuances of those who fight, those who die, and those who return from battle. When I see politicians pimp war, I think of King Agamemnon. When I think of men broken, numbed by the loss of comrades, changed by the face of battle, I think of Achilles. And that is probably the biggest fault of this book. Alexander is clumsy in her modern war parallels. She tries to link Homer's take on the Trojan War and tragedy of Achilles to the Great War, Vietnam, and Iraq. These links and passages are clumsy and unnecessary. Any reader who is mildly aware of Iraq and Afghanistan will find their own links to Homer's great work. There are certain classics that well deserve their place in the pantheon of great books and written art. Homer's poetry certainly belongs among the noble books written by both gods and men. Alexander's book is a worthy exploration of that great epic poem. Wow! I just finished listening to this book. I can't believe how much I learned about Homer's Iliad and the Trojan War. This is a Five Star book. It is well worth the credit. Completely Brilliant!! Fresh and thrilling POV! I am so blown away that someone could make this age-old story fresh and new!! Caroline Alexander has written an extraordinary book, with an in-depth look at the actual events of Homer's Iliad. Not the historicity of the events, though it is discussed, but she focuses on the importance and meaning of the language, characters and events in this epic story. I've studied it in high school, college, and have read innumerable books that look at every aspect of the Iliad. However, this author makes it all seem brand new! Setting each scene in the context of the contemporary meaning, Alexander's interpretation opens a whole new enchanting world to readers, reviving this tired tale to its intended glory! Anyone with a passing interest of ancient history will enjoy this audiobook. Michael Page is the PERFECT narrator. Making it a must buy!! I'm thrilled that decided to listen to this! A great surprise find! I listened to this book while also listening to Homer's Iliad. A wonderful narration which much increased my appreciation of this extraordinary and tragic tale. The narrator beautifully captures the text.